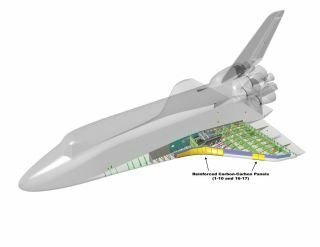 These detailed views represent a space shuttle left wing with Reinforced Carbon-Carbon, or RCC, panels with only those panels numbered 1 through 10, 16 and 17 shown. Each wing's leading edge had 22 RCC panels. A decade has passed since the ill-fated Columbia space shuttle orbiter and its seven-person crew ended their journey in catastrophe. During its Feb. 1, 2003 plunge back to Earth, the vehicle broke apart, with wreckage strewn across east Texas and western Louisiana. Painstaking work by the Columbia Accident Investigation Board (CAIB) later identified the physical cause of the disaster as damage to Columbia's left wing that occurred just 81.9 seconds after launch. A piece of insulating foam separated from the left "bipod ramp" that connected the shuttle's fuel tank to the orbiter, gouging a hole in a reinforced carbon-carbon (RCC) panel on the leading edge of Columbia's left wing. Now, 10 years later, new information is coming to light on an event early in Columbia's mission, often termed the "Flight Day 2 Object." Scott Hubbard, Columbia Accident Investigation Board member, inspects damaged Reinforced Carbon-Carbon (RCC) panel #8 following test. About a day after launch on Jan. 16, 2003, with Columbia's crew settling into its mission, an object roughly the size of a notebook computer drifted away from the orbiter out into space. According to a source that asked not to be named, "due to a procedural issue" the object was not recognized during Columbia’s 16-day mission by the Air Force Space Command (AFSPC). That AFSPC procedure was later corrected. The Flight Day 2 object, according to a source then working with the CAIB to help discern the cause of the Columbia calamity, was a fragment of the RCC panel on the orbiter's wing. A team of experts concluded that the departing piece had been lodged within the left wing by aerodynamic forces on Columbia's liftoff. It was set adrift after the orbiter reached space. The CAIB made the final conclusion that the foam-shedding incident on Columbia's takeoff affected panel 8 of the RCC heat-shielding, which was located on the orbiter's leading edge. That foam strike punctured a hole in the RCC panel roughly 16 inches (41 centimeters) by 16 inches. Analysts estimated that a hole as small as 10 inches (25 cm) across could have caused the orbiter to be destroyed on re-entry through Earth's atmosphere. That left-wing damage permitted the penetration of hot, re-entry gases, which led to the loss of Columbia and its crew. Superheated air entered the leading-edge insulation and progressively melted the aluminum structure of the left wing, until increasing aerodynamic forces led to loss of control, failure of the wing and disintegration of the orbiter. From a re-entry standpoint, Columbia broke up very late, at a low altitude, roughly 30 to 35 miles (50 to 55 kilometers) above Earth, where heating had almost ceased. The breakup was primarily mechanical, due to localized heating that occurred earlier in the re-entry process. Image of space shuttle Columbia in orbit during mission STS-107 were taken by the U.S. Air Force Maui Optical and Supercomputing (AMOS) site on Jan. 28, four days before Columbia's re-entry, as the spacecraft flew above the island of Maui in the Hawaiian Islands. A number of experts who studied the loss of Columbia and its crew shared their theories on the cause of the Flight Day 2 incident with SPACE.com. Early on, experts had thought that perhaps a piece of orbital debris hit the shuttle. In post-disaster work, an Air Force Space Command Space Analysis Center team worked with the Space Surveillance Network (SSN), a worldwide system of U.S. Army, Navy and Air Force-operated ground-based radars and optical sensors. That team and SSN operators went back after Columbia's demise to see if there had been any serendipitous observations taken the orbiter during its mission by accident, among the wealth of photos of the sky during that period. Indeed, that team did find some observations and noted there was another piece of debris in orbit with Columbia starting on Day 2 of its flight. Aiding in this identification was the fact that Columbia had been in a unique orbit, for not only the shuttle but virtually any other satellite, so there wasn't much else in the orbit. After noting the Day 2 object, researchers began an investigation to determine the object's separation velocity and its time of release from Columbia. Investigators hoped to see if the object departed the orbiter at high velocity, indicating a possible collision, or if it came off at low velocity, signifying something drifting away, perhaps out of Columbia's cargo bay. FEMA official surveys shuttle debris along with the Columbia Accident Investigation Board near Nacogdoches, Texas. With radar information on hand concerning the object's size, and measurements of how quickly it decayed in Earth orbit, analysts could tell it was something with the dimensions of a notebook computer. Best estimates are that the Flight Day 2 object decayed from orbit on Jan. 20, disintegrating as it fell down through Earth's atmosphere. The item was never given a satellite catalogue number since it decayed before its discovery. The Air Force and SSN analysts worked closely with Air Force Research Laboratory (AFRL) specialists, all focused on understanding the object's makeup and attempting to tag likely materials that had the right density. A final determination, according to a SPACE.com source, was that it was a piece of Columbia's carbon-carbon leading edge. "That determination encouraged NASA to continue their testing of firing foam at the leading edge … finally getting a result that very closely matched our analysis," the source, who asked not to be named, said. A post-disaster review of Columbia's movements on Day 2 showed the detached object appeared to separate after the orbiter undertook a couple of maneuvers to change its orientation. The Space Analysis Center team believed that aerodynamic forces on ascent had pushed the Day 2 object back into the wing and Columbia's maneuvers subsequently shook the object loose. Another view of the situation at the time is offered by a Columbia Accident Investigation Board (CAIB) member, Scott Hubbard, then director of the NASA Ames Research Center and currently professor of aeronautics and astronautics at Stanford University. Hubbard played an instrumental role in spotlighting the cause of Columbia's demise. To do so, he relied on computational modeling, reinforced by experimental testing with a large compressed-gas gun done by Southwest Research Institute (SwRI) scientists and engineers in San Antonio, Texas. During the tests, scientists fired a piece of foam at a target at speeds comparable to what a falling piece of debris from the shuttle would have experienced. Researchers then observed the damage. Hubbard oversaw those tests, which showed that a chunk of falling insulating foam from the large, exterior fuel tank could indeed punch a hole in the leading edge of the orbiter's left wing — panel 8 of the RCC thermal protection system, to be exact. "My decision to direct as definitive a test as possible of the foam impact on Columbia was driven by the desire to provide the crew and shuttle program with a clear, physical cause so that 'return to flight' could be carried out without hesitation," Hubbard told SPACE.com. While there was a significant collection of circumstantial evidence — film of launch, "black box" data and collected debris — Hubbard said he had the strong sense that NASA was not converging on an answer to such basic parameters as the size of the falling foam. "I can state quite unequivocally that the AFRL examination of the radar profile had no influence on the selection of the SwRI test parameters. Computational fluid dynamics analysis, the 35mm film data and emerging debris information had already convinced my team and me to aim at Panel 8 of the RCC." The AFRL did not issue their final summary report until July 20, 2003, nearly two weeks after the definitive SWRI tests, Hubbard said. "It is worth noting that the SWRI tests did produce a large section of RCC that, had it floated away from the orbiter, may have resembled the 2nd day piece," Hubbard said. "However, this observation is definitely post hoc and was not a test prediction." FEMA and State of Texas officials survey damage caused by falling shuttle material. According to CAIB report findings, the Day 2 object was discovered after the accident during Air Force processing of space surveillance network data, which yielded 3,180 separate radar or optical observations from Air Force and Navy sensors. It was the post-accident, detailed examination of these observations that revealed the Day 2 object. After SPACE.com requested help in clarifying why the Day 2 object was not recognized during the mission, and what procedural error had since been fixed, an Air Force Space Command spokesperson responded with a statement. space situational awareness process involving space shuttle missions after the space shuttle Columbia accident," the AFSC statement notes. "Before the Columbia accident, the Space Control Center did conjunction analysis (collision avoidance) during space shuttle missions using NASA positional data which better modeled the predicted position of Columbia for the conjunction screenings since it was more accurate than the data from AF sensors." The AFSC statement explains that the NASA positional data came from their sensors, which could more accurately detect and model small orbital adjustments of the shuttle during missions than could other methods. Since NASA provided this positional data, the Space Control Center processed AF sensor data for Columbia using only basic astrodynamic algorithms and models. These, however, failed to provide high enough fidelity to definitely separate potential debris from the space shuttle orbiter. "After the space shuttle Columbia investigation, the Space Control Center, in conjunction with NASA, decided to add additional analyst time to search for objects in close proximity to the shuttle, using both NASA positional data and Air Force sensor data," the statement explains. "It was determined in hindsight that while the previous process of using NASA positional data made space shuttle collision avoidance better, it degraded the possibility of cataloguing debris near the space shuttle during missions. Changing the process to use both NASA positional data and Air Force sensor data improved the ability to possibly detect debris near the space shuttle during missions," the statement concludes. Leonard David has been reporting on the space industry for more than five decades. He is former director of research for the National Commission on Space and has written for SPACE.com since 1999. He reported on the Columbia accident in 2003 and subsequent hearings of the Columbia Accident Investigation Board.